In nearly every state across America, Governors are facing major budget deficits. Many, Democrat and Republican alike, are cutting state aid to schools and other local governments - which will force massive layoffs, massive property tax increases or both. In Wisconsin, we are doing something progressive in the best sense of the word. We are implementing reforms to protect middle class jobs and middle class taxpayers. While our idea may be a bold political move it is a very modest request of our employees. We are reforming the bargaining system so our state and local governments can ask employees to contribute 5.8% for pension and 12.6% for health insurance premiums. These reforms will help them balance their budgets. In total, our reforms save local governments more than $700 million each year. Most workers outside of government would love our proposal. Over the past several months, I have visited numerous factories and small businesses across Wisconsin. On these tours, workers tell me that they pay anywhere from 15% to 50% of their health insurance premium costs. The average middle class worker is paying more than 20% of his or her premium. Even federal employees pay more than twice what we are asking state and local government workers to pay and most of them don’t have collective bargaining for wages or benefits. These facts beg the question as to why the protesters are in Wisconsin and not in Washington, D.C. By nearly any measure, our requests are quite reasonable. Beyond helping to balance current and future budgets, our reforms will improve the quality of our governments. No longer will hiring and firing be done solely based on seniority and union contracts. Instead, schools - as well as state and local governments - will be able to make decisions based on merit and performance. This concept works well in Indiana. In 2005, Governor Mitch Daniels reformed collective bargaining. In turn, the government got more efficient, more effective and more accountable to the public. Governor Daniels even encouraged employees to come forward with ways to save taxpayer dollars and they responded. Eventually, the state was able to reward top performing employees. This is true reform – making government work for the people. A recent columnist on these pages opined that “common problems deserve common solutions” suggesting that Republicans and Democrats work together. In principle, that is a good idea. Since January 3rd, we passed some of the most aggressive economic development legislation in the country. And on nearly every measure, many Democrats joined with all of the Republicans and an Independent to vote in favor of the various pieces of legislation. The Wisconsin legislature recognized that we are growing, not Republican or Democratic jobs, but Wisconsin jobs. Together, we worked to show that Wisconsin is open for business. But sometimes, bi-partisanship is not so good. During several of the past budgets, members of both political parties raided segregated funds, used questionable accounting principles and deferred tough decisions. This, along with the use of billions of dollars worth of one-time federal stimulus money for the budget two years ago, left Wisconsin with the current $3.6 billion deficit. Our reforms allow us to take a new and better approach. Instead of avoiding the hard decisions and searching for short-term solutions, we make a commitment to the future. The choices we are making now in Wisconsin will make sure our children are not left picking up the pieces of the broken state budget left behind. Our reforms create the lowest structural deficit in recent history ensuring our budget is stable for decades to come. These changes will give businesses the confidence they need to grow and invest in our state. We live in the greatest nation on earth because for more than 200 years we’ve had leaders who cared more about their children and grandchildren than themselves. Having the courage to make decisions in the best interest of the next generation – despite external pressures – is a concept that America has always admired, but is forgetting today. My hope is that Wisconsin will remind the nation what makes our country great. Two Michigan Democrats were arraigned Wednesday on election corruption charges for allegedly propping up of fake tea party candidates in 2010, the Detroit News reports. Former county Democratic Party Chairman Michael McGuinness and ex-operations director Jason Bauer have been charged with forgery, putting people up for office without their knowledge and other charges. The two party leaders allegedly conspired to field phony tea party candidates in an apparent bid to siphon off GOP votes and boost Democrats in two Michigan County Commission races and a state Senate race last year, according to the newspaper. Several of the charges are felonies, some of which carry penalties of up to 14 years in prison. McGuinnes and Bauer resigned their positions in August. News reports indicate they have not commented on this week's charges. Last year, as tea party power grew across the country, tea partiers began accusing Democrats and others of using their party label to run fake candidates and skew elections. A lawsuit was filed in Florida last year where Democrats, including then-Rep. Alan Grayson, were accused of creating a Florida Tea Party. Could a Wisconsin-esque impasse happen here? The weeks of angry protest and heated controversy in Wisconsin have sparked a national debate over the role of public sector unions and whether mandatory collective bargaining contributes to massive increases in spending, rising taxes and chronic budget deficits. With our state facing its own $4.5 billion deficit, the question naturally arises, could Wisconsin-style collective bargaining protests happen here? It’s entirely possible — because Washington already has the same kind of collective bargaining system in place. In 2002, majority Democrats in Olympia passed a sweeping collective bargaining bill and sent it to Gov. Locke for his signature. It was treated like a routine civil service law, but it actually represented a radical shift of power from the legislature to the governor’s office. With the stroke of a pen, lawmakers lost control of more than $2 billion in wages per year, and a further $608 million annually in healthcare, step increases, cost-of-living raises and other employee benefit costs. In the four years after collective bargaining went into effect, state spending increased 33 percent. In Olympia, state operating costs are now decided in a series of closed-door meetings between union executives and governor appointees. The negotiations are secret. The public is not allowed to know the starting and ending positions of each side, what is discussed, the amount of public money involved, or what concessions each side makes. No legislative oversight or public comments are permitted. The meetings are not covered by TVW, and are not subject to the Freedom of Information Act. Lawmakers cannot attend negotiating sessions, offer proposals or participate in the discussions. They may only vote up or down, with no amendments, on the final binding agreement. A dramatic example of how collective bargaining restricts lawmakers’ control over the budget occurred last November when, to help solve the budget deficit, Gov. Gregoire asked state employees to contribute 26 percent of the cost of their health coverage, a level typical in the private sector. Union executives refused, even though the governor had been elected with strong union support. Instead the union agreed to a small increase of just 3 percent in how much state workers contribute. Taxpayers pay about $850 per month for each employee’s health coverage, while state workers pay a fraction of that. The union’s rejection of the governor’s request will mean bigger cuts in public services. In addition to collective bargaining, public sector unions are heavily involved in politics. In 2010, public unions spent $2.7 million dollars to help elect or defeat candidates for state legislative office. Major campaign contributors included Service Employees International Union (SEIU) and the American Federation of State, County and Municipal Employees (AFSCME), labor organizations that also conduct collective bargaining negotiations. Nationally, unions gave $171 million to political candidates in 2010. “We’re spending big — and we’re damn happy it’s big,” said AFSCME’s national president Gerald McEntee during last fall’s campaign. In 2010, one political consulting firm, Moxie Media, used union funds to create up to 40 political action committees to obscure the source of contributions it made to state legislative candidates. The firm’s executives were accused of using contributions from public-sector unions and other sources to create a fake Republican campaign against a Democrat incumbent. The political strategy led to a campaign finance investigation by the Public Disclosure Commission and the state Attorney General. Unions represent the interests of their members, but the outcome of elections determines who represents the public interest at the negotiating table. Collective bargaining severely hampers the legislature’s ability to carry out its normal constitutional functions. In addition, experience indicates collective bargaining contributes to higher labor costs to the state, especially healthcare costs, without necessarily improving the quality of services delivered to the public. As some critics put it, under collective bargaining the governor bargains and the unions collect. Ending Washington’s 10-year experiment with mandatory collective bargaining would serve the public interest because it would return control of state operating costs to the Legislature, restore constitutional balance with the executive, and reduce the political influence of union campaign spending on public policy. Atlas Twitches: Is America Becoming A Welfare Nation? Entitled: More than one-third of all wages and salaries in this country are actually government handouts. We should be alarmed that we've become a nation of dependents. Using data mined from the Bureau of Economic Analysis, TrimTabs Investment Research has found that 35% of wages and salaries this year will be in the form of a government payment. That's up sharply from 2000, when it was 21%, which is more than double the rate — 10% — of 1960. In any case, we're seeing before us a disturbing trend. A society can't survive moving in this direction. The ratio of producers — those whose wages and salaries aren't drawn from the public trough — to non-producers, who consume wealth, needs to be much higher. One way to do this: spread the tax burden more equitably across incomes. Today, more than 97% of federal income tax receipts are paid by the top 50% of income earners. The bottom 50%? They pay less than 3% of the taxes, making it a truly privileged class because many of its members get to live at the expense of others. The bottom half of earners pay less of the federal income tax burden each year while the top half pays more. How long can such a ruinous set of affairs continue? When will the truly productive grow weary of the burden of holding up others and go on strike, as they did in Ayn Rand's "Atlas Shrugged?" We know, thanks to TrimTabs, that in Britain 44% of wages and salaries are from the public fisc. So, yes, it can get worse. But that'll be of little consolation if America follows Britain over the cliff. To avoid the inevitable decline, Washington has to change the policies that have gotten us where we are — and soon. Tax rates need to be lower and flatter. Punishing the rich with higher rates and rewarding the bottom half with lower or no rates violates the constitutional guarantee of equal treatment under the law. It also creates unnecessary tensions between classes, which itself goes against the American grain; establishes a set of perverse incentives that hurt wealth creation; and offends the streak of independence from government that helps define our exceptionalism. Policymakers will have to fix the entitlement problem, too. Americans have paid into Social Security and Medicare and deserve to get a return on their "investments." But entitlements will break the federal government and the private economy if they continue as is. Let the private sector solve this problem. It can do it. Decades of daft policies can't be turned around in a single session of Congress, of course. But the repair has to start soon. The longer lawmakers wait, the closer we get to the edge. Government payouts — including Social Security, Medicare and unemployment insurance — make up more than a third of total wages and salaries of the U.S. population, a record figure that will only increase if action isn't taken before the majority of Baby Boomers enter retirement. Even as the economy has recovered, social welfare benefits make up 35 percent of wages and salaries this year, up from 21 percent in 2000 and 10 percent in 1960, according to TrimTabs Investment Research using Bureau of Economic Analysis data..
"The U.S. economy has become alarmingly dependent on government stimulus," said Madeline Schnapp, director of Macroeconomic Research at TrimTabs, in a note to clients. "Consumption supported by wages and salaries is a much stronger foundation for economic growth than consumption based on social welfare benefits." The economist gives the country two stark choices. In order to get welfare back to its pre-recession ratio of 26 percent of pay, "either wages and salaries would have to increase $2.3 trillion, or 35 percent, to $8.8 trillion, or social welfare benefits would have to decline $500 billion, or 23 percent, to $1.7 trillion," she said. Last month, the Republican-led House of Representatives passed a $61 billion federal spending cut, but Senate Democratic leaders and the White House made it clear that had no chance of becoming law. Short-term resolutions passed have averted a government shutdown that could have occurred this month, as Vice President Biden leads negotiations with Republican leaders on some sort of long-term compromise. "You've got to cut back government spending and the Republicans will run on this platform leading up to next year's election," said Joe Terranova, Chief Market Strategist for Virtus Investment Partners and a "Fast Money" trader. Terranova noted some sort of opt out for social security or even raising the retirement age. But the country may not be ready for these tough choices, even though economists like Schnapp say something will have to be done to avoid a significant economic crisis. A Wall Street Journal/NBC News poll released last week showed that less than a quarter of Americans supported making cuts to Social Security or Medicare in order to reign in the mounting budget deficit. Those poll numbers may be skewed by a demographic shift the likes of which the nation has never seen. Only this year has the first round of baby boomers begun collecting Medicare benefits —a nd here comes 78 million more. Social welfare benefits have increased by $514 billion over the last two years, according to TrimTabs figures, in part because of measures implemented to fight the financial crisis. Government spending normally takes on a larger part of the spending pie during economic calamities but how can the country change this make-up with the root of the crisis (housing) still on shaky ground, benchmark interest rates already cut to zero, and a demographic shift that calls for an increase in subsidies? At the very least, we can take solace in the fact that we're not quite at the state welfare levels of Europe. In the U.K., social welfare benefits make up 44 percent of wages and salaries, according to TrimTabs' Schnapp. "No matter how bad the situation is in the US, we stand far better on these issues (debt, demographics, entrepreneurship) than other countries," said Steve Cortes of Veracruz Research. "On a relative basis, America remains the world leader and, as such, will also remain the world's reserve currency." Budgets do not come from the White House. They come from Congress, and the party that controlled Congress since January, 2007, is the Democrat Party. They controlled the budget process for FY 2008 and FY 2009, as well as FY 2010 and FY 2011. 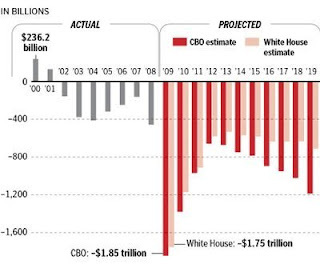 In that first year, they had to contend with George Bush, which caused them to compromise on spending, when Bush somewhat belatedly got tough on spending increases. For FY 2009, though, Nancy Pelosi and Harry Reid bypassed George Bush entirely, passing continuing resolutions to keep government running until Barack Obama could take office. At that time, they passed a massive omnibus spending bill to complete the FY 2009 budgets. In other words, if the Democrats inherited any deficit, it was the FY 2007 deficit, the last of the Republican budgets. That deficit was the lowest in five years and the fourth straight decline in deficit spending. After that, Democrats in Congress took control of spending, and that includes Barack Obama, who voted for the budgets. If Obama inherited anything, he inherited it from himself. I have found from first hand experience that the City of Olympia has an even more lucrative financial scam working than the City of Bremerton’s much-hated red-light cameras. I’ve had to spend an inordinate amount of time in Olympia lately lobbying legislators on behalf of Port Orchard, working with other local elected officials trying to preserve funding for the Ferry System, while imploring lawmakers to stand up to the ferry unions and fix the underlying financial and mismanagement problems, as well as testifying about various bills that impact the City. Parking around the Capital is a crapshoot at best. There is metered parking on the Capital campus, but unless you’re there in the wee hours to secure a spot, it’s usually spoken for. There is one hour parking on the streets around the Capital, but here’s where the scam comes in. It’s all zoned parking, so you can only park in the entire zone — which encompasses about a square half mile — for one hour. Moving your car doesn’t help. The City Parking Nazis are equipped with hand-held computers that record your license number and the time your vehicle is marked. If you park anywhere in the zone — even if it’s not in the same space — for more than an hour, you’re ticketed — $15 bucks. I found this out the hard way when I parked, met with a legislator, and left for an appointment with the City’s lobbyist about 45 minutes later, which took place miles away. I was gone for about 90 minutes, before coming back for another appointment. Although I was parked the second time for less than 30 minutes, I returned to find a ticket on my windshield. So I called the City, believing an error had been made because I parked the second time in the same block, but in a different space, and thought perhaps since my license plate had been recorded, the Parking Nazi didn’t realize I’d moved. After leaving two messages, upon my third call, I finally connected with someone named Debra (or maybe Deborah), who I was informed was in charge of the Parking Nazis. It was she who triumphantly informed me about the parking zone scam. When I asked her what the alternatives to parking within the zone are, with that totally uncaring, unreasonable, typically unrealistic, and heavily blasé, from another planet governmental attitude, she suggested I park several miles away in a lot offering a shuttle to the Capital. She told me they run every 15 minutes. Knowing exactly where that lot is, I replied that it takes 15 minutes to get there from the Capital freeway exit, another 15 to wait for the shuttle, 15 more to ride to the Capital, about five minutes to walk to where my appointment would be, typically 15 to 30 minutes for the appointment, five more to walk back to the shuttle stop, 15 to wait for the shuttle, another 15 to get back to the lot, and 15 more to return to the Capital exit to get on the freeway to go home — total of more than two hours if you count the appointment time, for a 15 to 30 minute appointment. I told Debra (or is it Deborah?) I didn’t believe that was the best use of the City of Port Orchard’s taxpayer dollars, and asked if there wasn’t a more time and cost-efficient solution. I’ll tell you this: If someone like that — with what I’d view as a piss-poor attitude — worked for the City of Port Orchard, I’d fire them in a New York minute. But then again, we don’t rip off people who park in our City that way either. And unlike Olympia, we sincerely appreciate them — and the money they spend when they come and visit. The person who calculated this bit of information went to high school in Pittsburgh, Pa. He reportedly is now, and has been, a professor at The University of West Virginia in Morgantown, West Virginia for the last forty some years. I'll bet most people never bothered look at the clunker program in such depth. A clunker that travels 12,000 miles a year at 15 mpg uses 800 gallons of gas a year. A vehicle that travels 12,000 miles a year at 25 mpg uses 480 gallons a year. So, the average Cash for Clunkers transaction will reduce U.S. gasoline consumption by 320 gallons per year. The government claims the program took 700,000 vehicles off the road, so that's 224 million gallons of fuel saved per year. That equates to a bit over five million barrels of oil. Five million barrels is about five hours worth of U.S. consumption. More importantly, five million barrels of oil at $70 per barrel costs about $350 million dollars So, our government paid $3 billion of our tax dollars to save $350 million. I'm pretty sure they'll do a great job with our health care, though.